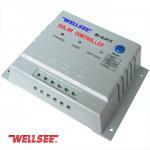 Wellsee solar controller has short circuit protection, if it happened short circuit, the solar controller will stop working automatically. Wellsee solar controller has reverse polarity connection protection, even the wrong positive and nagatie pole you connected, the controller will protect it. 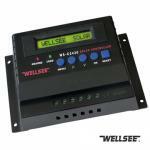 Wellsee solar controller has Converse discharge protection function. 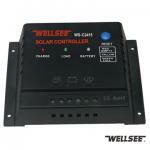 Wellsee solar controller has Thunder protection function. All modern dc power inverters have LVD built in, even cheap pocket-sized ones. The inverter will turn off to protect itself and your loads as well as your battery. Normally, an inverter is connected directly to the batteries, not through the charge controller, because its current draw can be very high, and because it does not require external LVD. So how do you know if a controller is malfunctioning? Watch your voltmeter as the batteries reach full charge. Is the voltage reaching (but not exceeding) the appropriate set points for your type of battery? Use your ears and eyes-are the batteries bubbling severely? Is there a lot of moisture accumulation on the battery tops? These are signs of possible overcharge. Are you getting the capacity that you expect from your battery bank? If not, there may be a problem with your controller, and it may be damaging your batteries. Thus, the control of battery charging is so important that most manufacturers of high quality batteries (with warranties of five years or longer) specify the requirements for voltage regulation, low voltage disconnect and temperature compensation. When these limits are not respected, it is common for batteries to fail after less than one quarter of their normal life expectancy, regardless of their quality or their cost. A good charge controller is not expensive in relation to the total cost of a power system. Nor is it very mysterious. At the leading solar controller manufacturer, wellsee solar controllers will be happy to help you find the suitable products, pls contact trade@e-bluelight., we will give you more detailed information and we would like to solve your problem if you have any questions for your current power system.